Recently we wrote about the need for Zimbabwean developers and service providers to embrace the opportunity of bots. It turns out that some startups had already been exploring this. 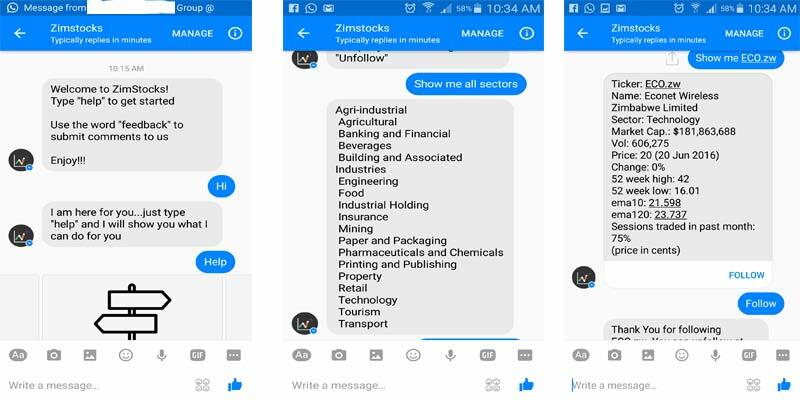 Zimstocks, the startup that brought us Android and iOS apps which provide investor information on Zimbabwean Stock Exchange (ZSE) counters recently launched its own chatbot or conversation interface on Facebook. The bot, which works on Facebook’s Messenger platform gives users access to the latest information on the various counters on the ZSE such as share and company performance, as well as investor related data such as market commentary, summaries on indexes, sector performances, and the latest inflation figures. To access the service, a user sends the message “Hi” to the Zimstocks Facebook page or does the same via Messenger. This is then followed up by the world “Help” to get the keywords needed to access the different features. Using the Zimstocks’ bot is pretty straightforward and like every other chatbot, it’s easy to get the hang of how to access what you really need once you know what you want to look for. Zimstocks’ adoption of a chatbot service is a significant endorsement of the latest tech trend that is slowly leading everyone to an appreciation of artificial intelligence and in in-app development. The fact that Zimstocks, which put a lot of effort into creating a presence on mobile through iOS and Android applications and managed to gain some decent visibility in the process, is already actively exploring chatbot use points to the evolution of information distribution through mobile devices. As far as internet access and communication go, Zimbabwe is already a predominantly mobile market and the preferences for internet access are tilted towards affordable options like WhatsApp and Facebook. Any service provider that can maximise on this with chatbots like what Zimstocks is trying to do here will be taking advantage of the realities of a market that needs more in-app features for the dominant apps rather than any more new apps. If Zimstocks’ chatbot manages to register a lot of engagement that outpaces its own apps this could just prove that Zimbabwe’s bot takeover is on the horizon. Looks smart. Great move there.